Long Distance Riding is a family sport, open to anyone with a horse. It is about going out and meeting people, riding through our countryside, and most importantly having fun! You don’t need any special equipment, particular breed or type of horse to get started, just you, your horse and your normal riding tack. For the most part riders are not competing against each other, nor is there a single winner. The one feature that is most commonly remarked upon is the unique atmosphere of camaraderie and support. 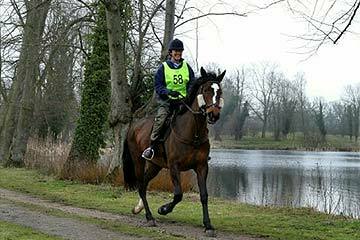 These are long distance rides which start at 30 km (20 miles) and horses must be registered with EGB and have a logbook. Rides progress between 30 km to 160 km (100 miles) over multiple days or in a single day. Depending upon the class entered various speed parameters and conditions apply, but in all the welfare of the horse is paramount and strict veterinary inspection take place both before and after the rides, also during the ride if the distance is over 55km (34 miles). Occasionally Sue has horses for sale.